Israel is acting in Gaza in self-defense to hostilities initiated - and prolonged -by Hamas. In clear violation of international law, Hamas and the other terrorist organizations in Gaza have fired thousands of rockets, indiscriminate weapons that target Israeli civilians. Tunnels dug from Gaza have been used to carry out terror attacks inside Israeli territory. Since the beginning of Operation Protective Edge, Israel has respected numerous ceasefires. Most of these were humanitarian lulls for the benefit of the residents of Gaza. Hamas, on the other hand, has violated all the ceasefires. Even a humanitarian lull initiated by Hamas was promptly violated by the terrorists themselves. Hamas also violated the 15 July ceasefire initiated by Egypt, supported by most of the international community, including the Arab League and accepted by Israel. Had Hamas respected this ceasefire, Israel would not have had to start its ground operation and much loss of life on both sides would have been avoided. · 15 July: Israel accepted the ceasefire initiated by Egypt and stopped all fire at 09:00. However, terrorists fired more than 50 rockets at Israeli communities. Only after six hours of continuous rocket attacks did the IDF respond. · 17 July: Israel agreed to a five-hour humanitarian ceasefire. The terrorist organizations rejected it and fired rockets, including at the city of Be'er-Sheva. · 20 July: Israel approved a two-hour medical/humanitarian window in the area of Shejaiya, following an International Committee of the Red Cross (ICRC) request. Forty minutes after the ceasefire began, Hamas violated it. Nevertheless, Israel implemented the ceasefire, even extending it for two more hours. · 26-27 July: Israel respected an UN-requested humanitarian ceasefire from 08:00-20:00 on Saturday, 26 July. Israel announced its readiness to prolong the ceasefire until midnight, but a few minutes after 20:00, Hamas renewed firing rockets at Israeli civilians. On the same day (26 July), Hamas announced a 24-hour humanitarian ceasefire, at 14:00. Hamas violated its own ceasefire a short time later. Despite Hamas’ continuous fire, Israel decided to extend the humanitarian ceasefire a second time, from midnight Saturday to midnight Sunday. · 28 July: Israel accepted Hamas' request for a ceasefire in honor of the Muslim holiday of Eid al-Fitr. The IDF was instructed to cease military attacks, but Hamas continued to launch rockets at Israel. · 30 July: Israel announced a temporary humanitarian ceasefire between 15:00-19:00. A few minutes after the ceasefire began Hamas fired rockets at the southern cities of Ashdod and Ashkelon, as well as other Israeli communities. Aleh Hanegev is a center based in the Negev taking care of severely disabled children. I have visited there and seen the wonderful conditions and the staff. With a war in Gaza and the indiscriminate firing of rockets by Hamas, who knows where they will land. Consequently at the Aleh center, special precautions have to be taken. read and account of how they deal with a code red alert of an incoming missile. A barrage of rockets cleave the skies over Ofakim and the neighboring area – including the Aleh Negev-Nahalat Eran Rehabilitation Village for the Disabled. A rocket falls directly inside the Village. Shards and shrapnel scatter widely – hitting Bet Shachar. Damage is sustained, with windows shattered and property destroyed. Miraculously – and also through careful adherence to the rules and regulations laid out by Home Front Command –residents and staff are unhurt. The windows shattered only in rooms that were empty at the time. Eran Hyosub, the shift manager, and Galia Ezekiel, the young woman volunteering at ALEH Negev as part of her National Service, were two of the staff members on duty that evening who had to make sure the residents were safely in the shelter. The Home Front Command has advised the management of the village to keep all residents in the safe rooms around the clock for the duration of the operation. Only those who can walk or can be moved quickly inside are able to take a short trip outside with their caregivers, but they are not allowed to venture very far from the shelters. Every building on the premises has a safe area. Ismail Haniyeh, the Hamas prime minister, delivered a revealing speech on March 23, 2014, in which he stressed the strategic importance of the Hamas attack tunnels, which, he argued, have changed the balance of power with Israel, when taken together with his organization's military build-up. In the meantime, the IDF's war against the tunnels continues. On Monday IDF forces thwarted another terror attack after two groups of Hamas operatives (numbering about ten) infiltrated from Gaza to Israel through a tunnel, apparently on their way to carry out a mass casualty attack at Kibbutz Erez and/or Kibbutz Nir Am. Since Operation Protective Edge began, IDF forces have foiled several other attempted attacks by Hamas near Kibbutz Sufa and Kibbutz Nirim that also made use of attack tunnels, while uncovering and blowing up dozens of tunnels in Gaza along its border with Israel. Thesetunnels penetrate deep into Israeli territory, sometimes reaching a length of 2.4 kilometers (1.5 miles). Hamas has accumulated a great deal of experience in using the tunnels for operational purposes. Since 2000, hundreds of tunnels have been dug along Gaza's border with Egypt, providing a lifeline for Hamas's military buildup. The tunnels have been a main conduit for Palestinian imports from Egypt on a scale of millions of dollars annually, and for smuggling military supplies (from ammunition to missiles) and the construction materials needed to buildthe network of attack tunnels in Gaza. Importation through the tunnels (it was in Egypt's political interest that this be referred to as "smuggling”) was fully controlled by the Hamas government, which levied a tax on the items and used its huge profits to accelerate its military buildup and preparation for hostilities with Israel. Tunnel warfare provided armies facing a technologically superior adversary with an effective means for countering its air superiority. For example, atunnel is opened only briefly to launch rockets and then immediately closed to prevent detection of the launchers' location by the IDF. The concealment of these launchers in tunnels, in the heart of the civilian population, makes it very difficult to detect them in real time and attack them. 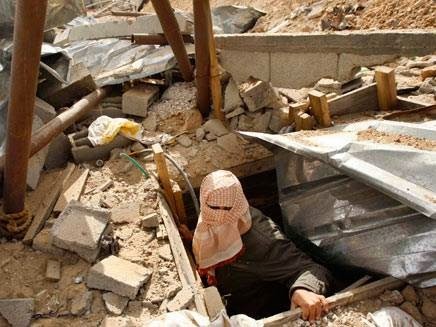 Hizbullah's tactics, learned from Iran, have been replicated in Gaza, particularly the use of the tunnels to provide "breathing space” in waging the military campaign. The Hamas-Hizbullah-Iranian aim is to cause as much harm as possible to the civilian population and weaken Israel by damaging its economy. Like Hizbullah, Hamas in the current round has tried to strike strategic targets in Israel and inflict mass casualties, including the nuclear reactor in Dimona, the chemical plants in Haifa, and Ben-Gurion International Airport. Despite the reconciliation agreement with Fatah and the establishment of the unity government, one of Hamas's objectives in the war is to ignite another intifada on the West Bank aimed ultimately at the toppling of Palestinian Authority rule and instituting a Hamas takeover of the Palestinian national movement. This current round of fighting highlights the importance of continued Israeli security control of key areas of the West Bank to prevent a Hamas takeover of the Palestinian Authority, and the maintenance of minimal defensible borders should a Palestinian state be established. Just as the British open a conversation by talking about the weather, so here in Israel the opening question is “Nu, ma hamatzav?” in other words, what is the status of the present “situation”, another word for the war with Hamas. These days are not normal days for majority of the population. Even here in the North of the country (we have had only a single “red alert”, and that at 3:30 am!!) everyone is affected in some way or another. At the beginning of the week the airwaves were humming asking everyone to pay their last respects to an American who went into the army as a lone soldier and was killed. The funeral was planned for 11:00 pm and the usual short 10-12 minute drive turned out to be 50 minutes. Cars blocked the roads as everyone tried to get to the cemetery and find somewhere to park. Estimates suggest that 20,000 people turned up, it was such an emotional feeling of national unity. I don’t know what the parents, who flew in from the States, thought. Today, another outpouring of national emotion was evident as another lone soldier from the USA was buried in Jerusalem. Estimates suggest that 30,000 people attended. Today, we received a text message informing us of a seriously injured soldier who is the grandson of a good friend in our neighbourhood and as we filled up with petrol after returning from Jerusalem, the attendant was telling me how worried he was because a grandson was in Gaza with the Israeli army. Another sign of the general public’s support for the soldiers in Gaza was the activity outside the supermarkets asking customers to buy “supplies for the boys”. See attached picture of my wife presenting todays contribution. Yesterday our neighbourhood also arranged a collection which was well supported. It is hard to imagine the “hell” they are in, fighting a gang of terrorist who know absolutely no rules and break all with impunity and yet the world seems more focused on the legal actions of a well-trained and humane army. A final reflection is that of one of our 17 year granddaughters with friends, taking time from their smart phones to go and visit injured soldiers and their families in a nearby hospital. Thus we approach the 17th day of the operation to clear out all the tunnels which are there for one purpose and one purpose only – to kill the maximum number of Jews! There's a Tunnel Under My House ! Imagine waking up in the middle of the night, hearing sounds of digging and drilling. You know that underneath your house there are monsters that are digging tunnels, trying to infiltrate your town. They are armed to their teeth with weapons, anesthetics and handcuffs, with the sole purpose of killing or kidnapping as much people as possible. This description is not a horror story. This is the reality for thousands of Israelis living around Gaza strip. No country can ignore such a threat. No nation would tolerate such danger. Israel has the right to defend itself. With children being killed in Gaza when they are caught up in the cross fire as Hamas terrorists utilise their presence to protect themselves in abuse of international law, the media have a story line ready made for their readers. However, not one of the international media outlets that I am able to watch pays the slightest bit of attention to the effect of Hamas terrorism on Israeli children. The continuing missile attacks from Gaza have been taking their toll on Israeli children. The following are facts and figures which have been compiled between 13-17 July:from medical sources. 93 Children were wounded by rockets, of which 1 is in a severe condition (multi-trauma wounds); 2 are badly injured; 55 suffer light wounds (cuts from shrapnel etc. ); 45 suffer from acute syndrome effect. Over 20,000 children were moved north to lesser threatened areas. Some facilities were relocated temporarily from the area bordering Gaza (up to 40 Km). For example, over 50 Special education children were transferred from a Kibbutz by the southern border to a safer location. A total of several thousand calls have been made to different stress treatment facilities, an average of 600-700 calls per day to trauma centers: CHOSEN centers for trauma and preparedness received 550 calls between 13-16/7; Calls to the regional stress centers (MATAN) between 13-16/7 there were over 100 calls from children and 127 visits by children. 7 regional authorities (each encompassing many municipalities of towns and villages) in the southern part of Israel cancelled all activity in thousands of schools and summer camps, affecting tens of thousands of children. This is just the tip of the iceberg since with the history of the conflict spanning years, the number of children growing up with psychological problems is immense. Of course there is sympathy for those Gazan children caught up in this war but where is the same level of sympathy for the children of Syria,Iraq and the other areas of conflict around the world? Hamas Interior ministry's guidelines issued the "Be Aware – Social Media Activist Awareness Campaign," via an instructional video posted on its official website and via posters published on its Twitter and Facebook pages. The ministry website included the following text along with its instructional video: "The Information Department of the Ministry of the Interior and National Security has instructed activists on social media websites, particularly Facebook, to correct some of the commonly used terms as they cover the aggression taking place in the Gaza Strip. The following Information Department video calls on all activists to use "the proper terminology", in order to play their part in strengthening the home front and in properly conveying information worldwide." 1) "Anyone killed or martyred is to be called a civilian from Gaza or Palestine, before we talk about his status in jihad or his military rank. Don't forget to always add 'innocent civilian' or 'innocent citizen' in your description of those killed in Israeli attacks on Gaza. 3) "Beware of spreading rumors from Israeli spokesmen, particularly those that harm the home front. Be wary regarding accepting the occupation's version [of events]. You must always cast doubts on this [version], disprove it, and treat it as false. 4) "Avoid publishing pictures of rockets fired into Israel from [Gaza] city centers. This [would] provide a pretext for attacking residential areas in the Gaza Strip. Do not publish or share photos or video clips showing rocket launching sites or the movement of resistance [forces] in Gaza. 5) "To the administrators of news pages on Facebook: Do not publish close-ups of masked men with heavy weapons, so that your page will not be shut down [by Facebook] on the claim that you are inciting violence. In your coverage, be sure that you say: 'The locally manufactured shells fired by the resistance are a natural response to the Israeli occupation that deliberately fires rockets against civilians in the West Bank and Gaza'..."
1. IDF spokesperson reports that Early Thursday morning (July 17), IDF forces thwarted an attack by Hamas terrorists attempting to infiltrate Israel through a terror tunnel. "This morning, IDF forces identified approximately 13 terrorists attempting to infiltrate Israel through a terror tunnel constructed by Hamas. The tunnel led underground from the southern Gaza Strip towards the southern Israeli community of Sufa. ​IDF forces thwarted an impending terror attack, preventing the terrorists from attacking an Israeli kibbutz. The foiled attack could have had deadly and devastating consequences if carried out. No injuries were reported to IDF soldiers. Terror tunnels are just one example of Hamas’ constant attempts to violate Israel’s sovereignty and security, by carrying out lethal attacks against Israeli civilians. As the IDF demonstrated in recent days, Hamas will not be able to launch strikes against Israel without consequences." 2. On July 8th, another major terrorist attack was foiled when a massive terror tunnel was exposed and was blown up close to the Kerem Shalom crossing, where dozens of truckloads of goods enter Gaza every day. 3. Both these foiled terror attacks took place close to the land crossings between Israel and Gaza, which function as important lifelines for the civilian population of Gaza. Despite these repeated attacks, Israel will continue to operate the land crossings in order to allow for goods to enter the Gaza Strip. Gaza Strip NGO Safety Office Project (GANSO) is a project of CARE International, funded by the European Commission’s Directorate General for Humanitarian Aid (ECHO) with the aim of providing the information and analysis the NGO community needs in order to implement humanitarian projects safely. CARE International is an international, non profit, secular confederation of 12 member organisations committed to fighting global poverty and delivering emergency aid in times of humanitarian crisis. CARE International’s Secretariat is based in Geneva and the 12 members work in more than 60 countries around the world. 9-22 January Of 36 Home Made Rockets (HMRs)/Mortars, 19 landed in Gaza. 23 January-5 February 50% fell inside Gaza. 20 February-5 March 6 dropped in Gaza. 6-19 March 24 out of 64 firings dropped short/exploded on-site. 20 March-2 April. 9 civilians injured and 1 death due to accidents involving explosive devices and unexploded ordnance. 3-16 April. 3 fatalities and 6 injuries due to accidental explosions. 17-30 April. 8 rockets dropped short out of 24. In summary, a significant percentage of rockets and mortars fired off by Hamas and Islamic Jihad fall short, never making it across the Green Line and do cause fatalities and injuries among civilians. Over 1350 rockets have so far, at least, been fired at Israel since the beginning of Operation Protective Edge. Just how many of those fell short and caused death, injury and destruction of property? With the failed attempt at a cease fire yesterday, it not being accepted by Hamas, the rockets continue. · Israel accepted the Egyptian brokered ceasefire, supported by the Arab League, but Hamas and Islamic Jihad rejected it. · By rejecting the ceasefire and continuing to launch rockets at Israel, Hamas demonstrates once again that it is more interested in terror than in caring for the citizens of Gaza. · Hamas is directly responsible for the continuing hostilities, and for the suffering caused to civilians on both sides. · Hamas commits war crimes by using Gaza civilians as human shields and cynically puts their lives in grave danger. Hamas deliberately embeds its military operations deep within residential areas, in schools, mosques and hospitals. · Hamas considers every man, woman and child in Israel a legitimate target. · Israel does not consider the population of Gaza as enemies. Israel does the utmost to avoid harming uninvolved civilians and is acting solely to weaken Hamas terrorist infrastructure and safeguard our civilians. · Israel's goal is to restore the quiet for its citizens while inflicting a significant blow on the terrorist organizations. · No country in the world would sit idly by while its civilian population is subjected to terrorist rocket fire. Israel is no exception. · There is no symmetry: "Israel uses missile defense to protect its civilians, while Hamas is using its civilians to protect its missiles" (PM Netanyahu). · The international community must strongly condemn Hamas and the war crimes it is perpetrating in order to put an end to suffering on both sides. · In 2005 Israel withdrew from Gaza to the last millimeter and every last settlement was removed, just as the international community demanded. It should now support Israel's campaign against Hamas. Hamas' actions are in clear violation of the most fundamental principles of the laws of armed conflict, including the principle of distinction. This principle requires parties to an armed conflict to refrain from deliberately targeting civilian population or civilian objects. Likewise, it requires parties to distinguish its military operations and the civilian population, and to refrain from using the presence of the civilian population to shield military objectives. · By deliberately attacking Israel's civilian population, including by conducting suicide, rocket and mortar attacks. · By deliberately and systematically employing tactics which put the Palestinian civilian population in danger, including the launching of attacks from within densely populated areas, the use of human shields, deploying weapons storage sites and command centers in residential homes and in densely populated areas and commandeering sensitive sites (such as hospitals, private homes, schools and mosques) for terrorist use. These actions clearly constitute war crimes, as defined by international law and may also amount to crimes against humanity. · Article 51(2): "The civilian population as such, as well as individual civilians, shall not be the object of attack. Acts or threats of violence the primary purpose of which is to spread terror among the civilian population are prohibited"
(b) Avoid locating military objectives within or near densely populated areas;"
· Article 51(7): "… The Parties to the conflict shall not direct the movement of the civilian population or individual civilians in order to attempt to shield military objectives from attacks or to shield military operations." · Article 12(4): "Under no circumstances shall medical units be used in an attempt to shield military objectives from attack. Whenever possible, the Parties to the conflict shall ensure that medical units are so sited that attacks against military objectives do not imperil their safety." In interview with PA TV, diplomat details possible risks to the Palestinians of their joining the International Criminal Court. Speaking on July 9 to Palestinian Authority TV on the possible risks involved if Palestinians leaders ask to join the International Criminal Court — as they have threatened to do in order to push for measures against Israel — Ambassador Ibrahim Kraishi said the “Palestinian weakness” in terms of international law is the indiscriminate firing of rockets at Israel. “The missiles that are now being launched against Israel, each and every missile constitutes a crime against humanity, whether it hits or misses, because it is directed at civilian targets,” said Kraishi. The ambassador said that, by contrast, Israel’s actions follow legal procedures, because the IDF warns Gazan civilians to leave sites and areas before they are bombed. “As for the missiles launched from our side, we never warn anyone about where these missiles are about to fall or about the operations we carry out,” he says. It should be noted that Israel is not a Party to the Additional Protocols. Nevertheless, it is Israel's position that a number of Articles in the Protocol reflect customary international law.